Pad Thai has to be one of my top favorite foods. I mean, it’s spicy chicken and noodles, who doesn’t love that? So I decided I needed to learn to make it myself, from scratch. The skinny reason is so I can know exactly what goes in it and cut down on the chemicals, oil, and MSG that tends to hide in take-out food. The fat reason is, I need to know how to make it to satisfy those 2 am cravings after a long night of…well, anything really. I looked on Pinterest and found so many different tweaks and recipes that I decided to keep it simple this time and work up from there. And it turned out great! I was pretty excited. To be totally honest I inhaled it before my brain registered “hey fatty, how about taking pictures?” but thankfully Adora has more forethought than I do (so you can thank her for the pic). Soak rice noodles in hot water for 8-10 minutes, or until tender, then drain. In a wok or large pan, sautee diced shallots, garlic, and chicken cut up into bit sized pieces. Cook over med/high heat until chicken is cooked through and begins to brown. Remove and set aside in a bowl. In the same pan, scramble eggs, then add noodles and sauce. Stir until mixed, then add in chicken mixture. Let cook a few more minutes to marry all the flavors. 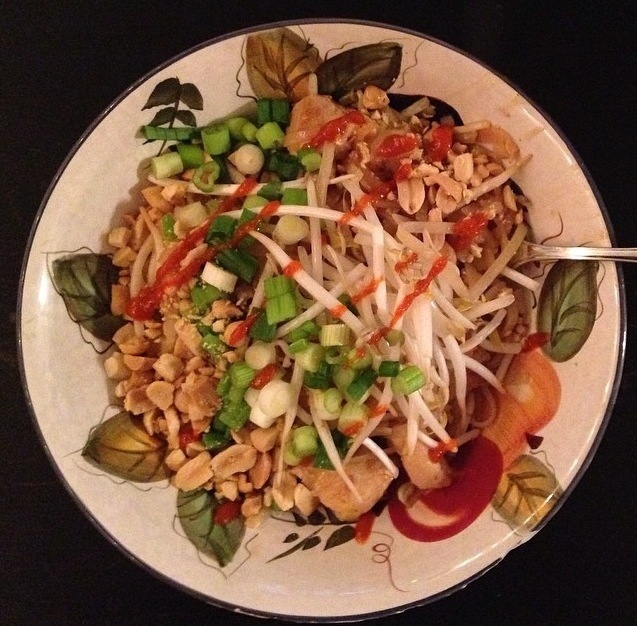 Serve garnished with sliced lime, crushed peanuts, green onion, and Sriracha.